This piece is called Unyielding. This is an extension of the 3rd piece in my Planet Exploration Series to something very similar to what I wanted to create. Enjoy. Will you let me use it as a background in my deviation? Just awesome... could u tell me how u did that "lightning-ish" effect. btw I didn't disappear i've been busy is all. Oh I was about to ask where on Earth did you go? If you want a basic crash course on that lighting effect check my scraps and search for my Help File. It'll show you a very general/basic way to do the nebula/lightning effect. Wow, simply amazing as always, the blue is so beautiful! your work continues to impress me everyday very well done! Thank you man that means a lot. Then may my pieces inspire your writing. Then my job is complete. Positively gorgeous- the colors blend so beautifully together! I LOVE the hint of purple in it! Sheesh man! You submitted this yesterday and you already have 20 comments! Heh, thx man. My tip to you as I tell everyone, comment, comment, and comment. If you like someone's piece tell them, they'll most likely do likewise. 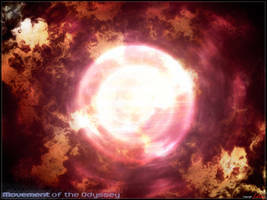 A supernova. Am I the first person to know that? Or a nebula. But judging by the glowing centre, I say a supernova. Little bit of column A, a little bit of column B.
ya gotta crouch. Down low... behind a rock. Very nice & agreed on the emotive & yet contradictory qualities of the hue...quite sure your friend will be pleased with such a gift. Thank you, she was when I showed her. Quite welcome and great to hear/read. Nice way of using those values of blue. Thank you, yes I love using blue, it's so calming yet chaotic, bah paradoxial values at it's best.